In the morning, we fix the flat. We swap the tube out and can't seem to find a hole in the old one, so we stash it back in our repair kit without patching it up. We ride on. We aim to end our days before it gets dark, and often fail. That first night after our relocation, we carry our sunburnt, beleaguered bodies into an Engen petrol station and ask the manager if we might camp right behind the station. He kindly agrees, and we carry a take-out bag of Wimpy's sandwiches to our tent. We hit the coast and bounce inland; we rebound and meet the coast some kilometers down the road. We pass through Velddrif, through Elandsbaii. We spend two nights camped on the beach, marine winds whipping our poorly-staked tent right until morning. We begin cooking food. Basic things. Spaghetti, typically. Our diet consists mainly of peanut butter sandwiches and bread, but sometimes we get bags of chips. We drink plenty of water. We climb from Elandsbaii to Clanwilliam and spend two nights camped next to a gorgeous dam in the mountains, perhaps the sole guests of the spacious campground. From Clanwilliam, we tackle those mountains, and we heave ourselves three thousand feet up the Cederbergs in just eighteen kilometers. We're treated to a thrilling descent down the pass. What comes down often goes up, and later we're forced to make up hundreds of meters of the elevation we'd just lost. The road turns to gravel at the second pass, and we carefully navigate our bikes down the twists and turns of the mountain road, slippery with loose stones and precarious without a guardrail. There's nothing but wilderness around us, wide open spaces with little hint of human life. There's quiet, placidity, and a quickly setting sun. This is the point where I'm supposed to say that life on the road is glorious. That we're having the time of our lives, living free, relishing these moments. That I don't know why we didn't do this sooner, that I don't know how we'll ever give this all up. That's how these stories are supposed to go. But things are hard. At times we're not really having much fun. I can only speak for myself, but we seem to share a disappointment about our first week on the road. I feel tired. Stretched thin. Rushed. I wake up with a feeling of dread, of pointlessness. I see little purpose in getting out of my sleeping bag just to be cold. 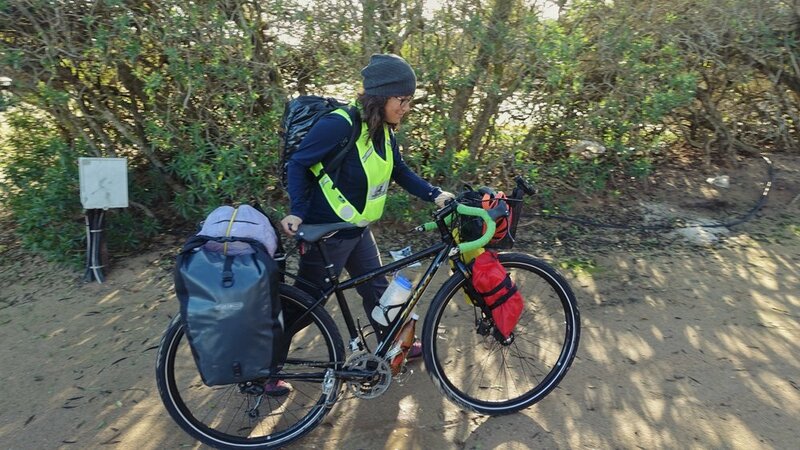 I have little motivation to pack all of my things into two overstuffed, smelly bags, strap them to a dusty assemblage of non-motorized transport, and pedal further from the civilization I know with no real aim, no real destination. We've climbed two passes, and no one cares. We're bumping along dozens of kilometers of washboarded road en route to our third, and it doesn't really matter. If we pedal slowly, we're just going to have to slog through this all for longer. We bicker. We say mean things to each other when the going gets tough. Our happiness and our connection feel inversely correlated to the grade of the road in front of us. Smiles turn downward as the road turns upward. There are sparks of joy, sure, but they feel like short bursts of light in a dark room. 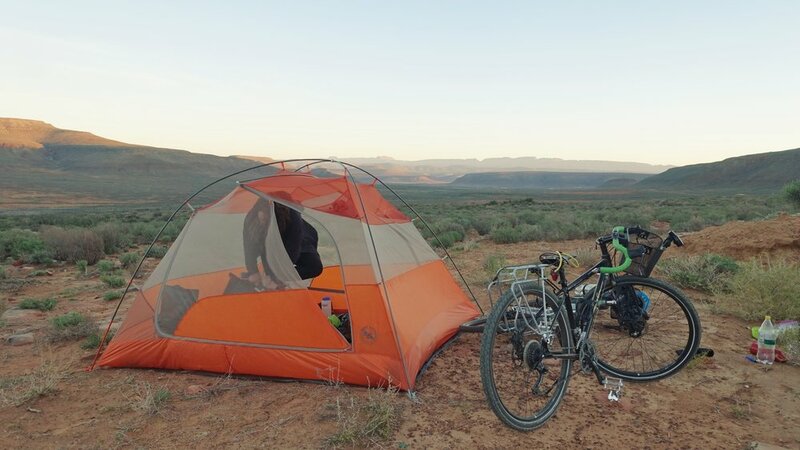 South Africa is a challenging place to begin a bike tour like ours. In winter, the days can be hot and the nights can be very cold. We are pedaling north in the southern hemisphere, and the sun is always in our faces, in our eyes. The sun affords us only about ten hours of light per day. The hills are strenuous. By the time we reach Loeriesfontein, some six hundred kilometers from Cape Town, we've climbed almost twice what we'll climb in our next two thousand kilometers through Namibia and Botswana. The earth here undulates endlessly. Almost everything we gain, we lose. And so we move slowly during the little daylight we have. The distances here can be vast. Often we're caught at dusk between two towns. We're perfectly prepared to wild camp, but even a grassy patch of a few square meters is hard to come by. Everything is locked away. From Cape Town onwards, there is the road, and maybe three meters of rock on each side of it, and then there are fences, tall and spiky. The grazing lands are immense, if grazing occurs at all. All gates are padlocked. Even the most dry, unforgiving squares of dust are chained off. This land used to be free, boundless, and now all of it is claimed and guarded. Some evenings, we pedal for ten or twenty or thirty kilometers in frustration, just looking for a place to lay our heads. Most landscapes don't even feature a farmhouse close enough to ask permission to use a little outside space for the night. The rare roadside accommodation is a fancier affair, out of our budget. Much is out of our budget. South Africa is expensive for us, and so we camp our first nine days traveling. We eat one prepared meal, the greasy bag of Wimpy's in our tent, and make the rest ourselves, in the dirt on the side of the road. These are the challenges. They are challenges of season, sure, and location, definitely, but also the challenges of change. Our routine has been demolished, our comforts ripped away. We are adjusting, and it has been a rapid adjustment. But we are adjusting. Things have flattened out, if only a little. The roads are sealed, for now. We splurge for a basic guesthouse room, shower, wash the red dust from our bodies and our clothes. We take a day off and cook oatmeal by microwave for a change. We reflect, reconnect with each other and friends back home, write. It's been a tough beginning, but there's plenty to be happy about. We've seen some beautiful mountains. Gorgeous valleys. One night, when the dirt is too tough to stake our rain fly and the wind too relentless to keep the fly quiet, we just take it off and camp with an unobscured view of the night sky. There are thousands of stars, a sliver of moon, the cloudy Milky Way, twinkling planets. I fall asleep watching shooting stars. The skies are like this every night. We've slowed down time. We've packed these past weeks with memories, more memories than I might make in months back home. Not all have been positive, but many have. We've met some wonderful people, been recipients of unbelievable generosity. We've pushed ourselves hard, and are feeling stronger for it. We've learned to better sense each other's limits. We've learned when we need to rest. We've learned how to get our tent erected in a minute flat, and how much water we require for more remote stretches. We've learned one large tub of peanut butter won't last us more than a day or two. It's a privileged opportunity, this pedaling around. That doesn't mean it's easy. But it's getting easier, bit by bit, and we're excited about the road ahead. On our last evening in Loeriesfontein, up in the Northern Cape, we fill our many water bottles. There are eight of them between the two of us, plus an eight-liter water filter that doubles as a bladder. The bikes groan under the weight. We're loaded up with quinoa, with almonds, with oatmeal and halva and instant noodles, and of course, plenty of peanut butter, bread, and spaghetti. It's 211 kilometers to Pofadder, a tiny outpost on the edge of South Africa. Between us and Pofadder lie no stores, no campgrounds, no rivers, no settlements. Not much of anything except a thin line of dry gravel road barely visible on a map. 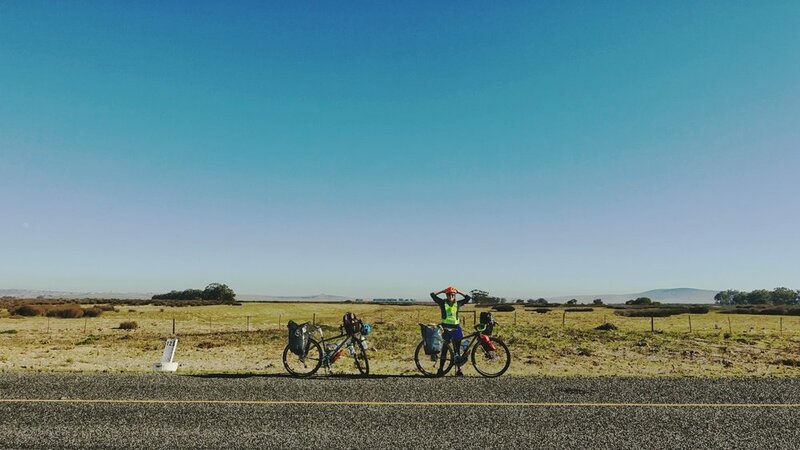 It's not the world's most challenging ride, but for us, it's both the longest single stretch of our short trip and the last long haul before Namibia. It's been a tough first week, but we're feeling better. Rested. Ready.